Eurabia begins to show it’s true colors. The UK’s national terrorism threat has been raised to its highest level after an attack on Glasgow Airport was linked to two car bombs found in London. Two men were arrested after ramming a burning car into the airport’s main terminal, a day after police thwarted two attempted bombings in the capital. Police said one of the men wore a “suspect device” and the incident was being treated as terror related. Prime Minister Gordon Brown urged the public to remain vigilant. 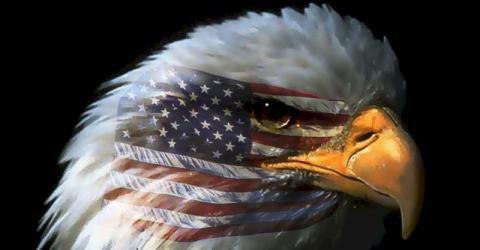 “I know the British people will stand together, united and resolute,” he added. Strathclyde Police told a news conference the attack on Glasgow Airport was now being linked to the car-bomb plot in London – foiled by police on Friday. 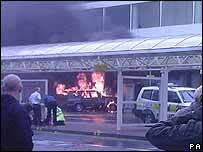 Two men were arrested at the scene at 1515 BST after the blazing car was driven into the airport’s main terminal. One of the suspects taken to the city’s Royal Alexandra Hospital to be treated for severe burns was in possession of “a suspect device” which had been found on his person, Chief Constable Rae said. BBC security correspondent Frank Gardner said the suspect device was thought to be a “suicide belt”.